Captain America is at a standstill. 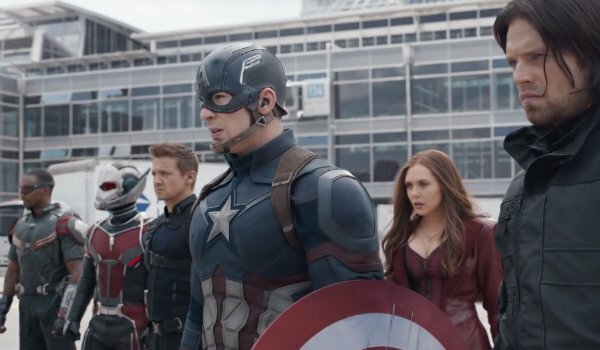 Flanked by Falcon, The Winter Soldier, Hawkeye, Scarlet Witch, and Ant-Man, he needs to get to an aircraft through a German airport, for now represented by a massive green screen. The main obstacle? Iron Man. 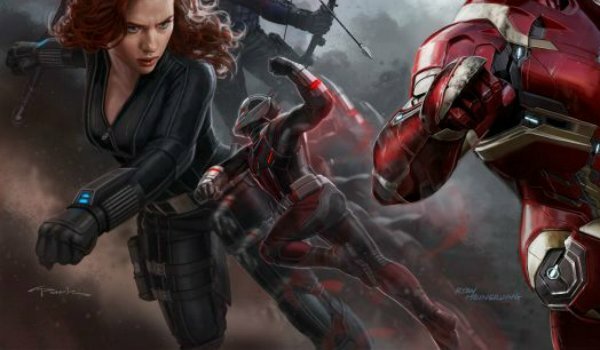 Tony Stark is under orders to stop the once golden boy of America in his tracks, so he's brought out the big guns: Black Widow, War Machine, Vision, and the new hero on the block, Black Panther. Soon, the scorching film set in Atlanta has turned into a frenzy as Team Cap sprints into battle. While Natasha Romanoff and Clint Barton exchange close-corner blows with no mind control to blame this time, the prince of Wakanda launches himself at Bucky Barnes, tearing his vibranium claws into the Winter Soldier's bionic arm. Meanwhile, Ant-Man is off doing his thing, stomping around in front of his own mini green screen. The Civil War officially has begun. How did Earth's mightiest heroes get to this point? Avengers: Age of Ultron left them displaced. Tony Stark (Robert Downey Jr.) hung up his Iron Man suit, Clint Barton (Jeremy Renner) went back to his family, Bruce Banner (Mark Ruffalo) flew off the grid, and Thor (Chris Hemsworth) blasted off to Asgard to hunt down more Infinity Stones. That left Steve Rogers (Evans) and Natasha Romanoff (Scarlett Johansson) with the task of assembling and leading a new team of Avengers. Sam Wilson (a.k.a. Falcon), Wanda Maximoff (a.k.a. Scarlet Witch), Vision, and James Rhodes (a.k.a. War Machine) answered that call. Sadly, their stint as a team will be short-lived. Captain America: Civil War sees the introduction of the Sokovia Accords, which the governments of the world pass to restrict superhero activity in light of yet another international incident. The action splits the team in half with some banding around Iron Man in support and others around Cap to fight tooth and nail against it. Add The Winter Soldier, Cap's best friend and Hydra's brainwashed lapdog, and allies will surely strangle each other. Ahead of the release of Captain America: Civil War on May 6, we have behind-the-scenes intel from the set on Cap and his army of rebels on the run. Captain America: The Winter Soldier (also directed by Joe and Anthony Russo) saw Steve face a personal challenge in every sense of the word — Bucky Barnes, his old World War II buddy, had been brainwashed and remade as the bionic-armed assassin The Winter Soldier. After a confrontation that left D.C. littered with hellicarriers, Bucky retreated back into the shadows to emerge again here in Civil War. 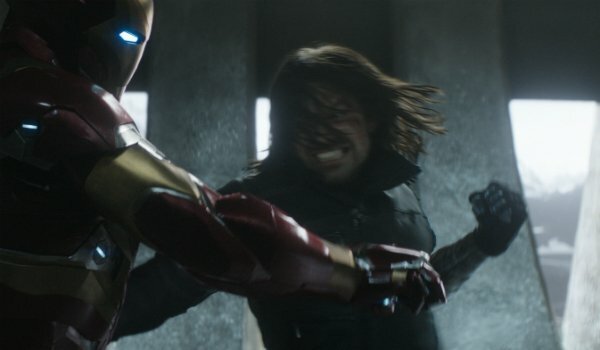 What makes it a Cap movie, again, is that external pressure is applied and then The Winter Soldier pops back up. Wait a second. So, all of a sudden, we were already kind of at odds with each other. And now this very true free radical shows back up. We don’t know if he’s a good guy. Is he a bad guy? Does he remember everything? Does he remember nothing? Siding with Bucky over the government is easier for Cap, who sees him as his best friend, but it’ll still be tough to go from America’s golden boy to rebel on the run. "Ultimately he knows he has a good heart. The problem is we all think we have good hearts, we all think we know what’s best. And this is the nature of compromise. It’s tricky to understand where to bend," said Evans, who believes the film’s antagonist line isn’t so clear. He continued, "I think Cap’s struggling because every time he has fallen in line, and has been a soldier, and has taken orders and leaned on the structure of society, it’s kinda turned on him. And I think he ultimately feels the safest hands are his own, because at least he can trust them. But again, that’s not gonna work for the masses. So it’s the first time he really doesn’t know what the right answer is." The last we saw of good ol’ Bucky, after he fished Cap’s unconscious, bloodied body out of water, was staring at photos of himself in the hero’s museum. "Where we find the character is really where he is at the post-credits scene at the end of Winter Soldier," Sebastian Stan said. "So that’s where he picks up in this film. It very much is a big struggle, figuring out what his life has been about and what he’s really been up to." Much like Cap, Bucky is a time-displaced soldier, only he didn’t have the good fortune of waking up from a frozen sleep in the hands of S.H.I.E.L.D. Hydra got their hands on him, fashioned a metallic arm to replace the one he lost and tortured him into becoming a slave for the villainous organization. Now that he’s finally his own person, the biggest challenge will be separating who he is from what he was forced to do. I’m just trying to tie in to what we know in the comic books. I think it’s going to be a mix of different things. He’s not gonna go back and be the guy he used to be. There’s just no way that would happen. He’s definitely, probably affected for life. It’s sort of learning about how you live with who you are now. Learning how to tame that wild beast that is a part of you at this point. 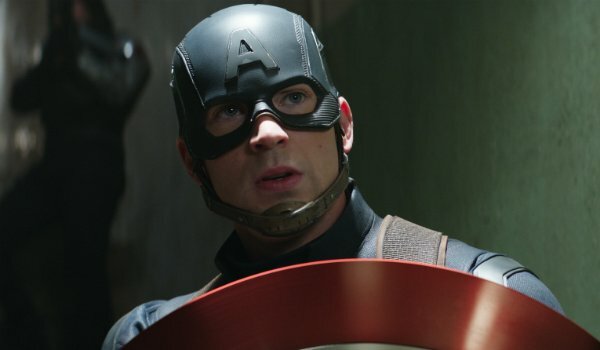 You have two sides that are already kind of fracturing, and now with the arrival of Winter Soldier, I don’t think it’s a stretch to say Cap is going to want to figure out how much Winter Soldier remembers and if he can still get his buddy back…So the first thing Cap is going to do is go find that guy. Well, if the [Avengers] team has been fractured in such a way that Cap is maybe no longer able to do that legally, it all of a sudden becomes very complicated. Now you have a guy working outside a new world order who finds himself in conflict because of a goal that has nothing to do with that central conflict but ultimately exacerbates that central conflict. Sam Wilson has become a delight to see on screen, thanks in large part to Anthony Mackie. 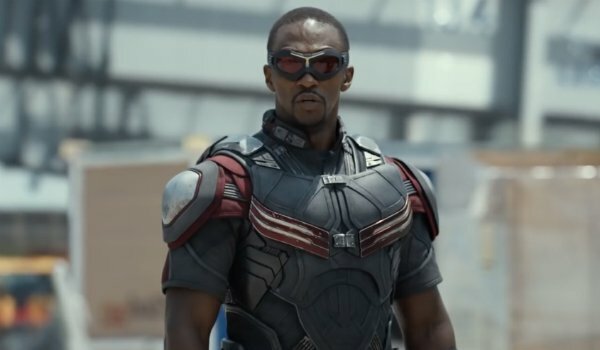 After debuting the character in The Winter Soldier, Falcon went on to appear briefly in Avengers: Age of Ultron and Ant-Man as he continues his search for Bucky while maintaining his new responsibilities as an Avenger. One thing that doesn’t seem to change is his relationship with his fearless leader. "I think there’s definitely a confidence and respect with the two of them and you get to see more of that," Mackie said. "I think our relationship in this is more of mano y mano as opposed to mano and friend. So, it’s not so much that it’s challenged, but it’s just made stronger." I get to continue my undying love affair with Black Widow, which is good, and no, I think more so in this one that I get to do that I haven’t done before is become my own person. Now, everyone knows who I am, so it’s not a, "Who’s the flying guy?" It’s more of, "Hey, Falcon is here." So, you can see my relationship with everyone else has grown, as opposed to being the new guy on the team. Even though Falcon is now able to get "Tony Stark-erized" with new gadgets and armor as an Avenger, Mackie said he thinks Iron Man’s just a nerd. "I don’t know why everybody thinks Tony is cool," he teased. "Tony thinks he’s really cool, but Falcon just thinks he’s a nerd, and not like a cool millennium nerd. Like, nowadays you see a nerd and it’s like hot chicks, like, I’m a nerd and you’re like, ‘What’s up?’ right. I’m talking about like a 1985 nerd. Nah, you don’t win. Nah." While a common question is whether or not certain characters will get their own standalone Marvel movies, Mackie is happy being part of an ensemble team. "So, if you take all of that away just so I can be number one on the call sheet, I would rather keep, my ego is well intact," he said. "I’m really cool with being that tall on the poster. Really cool. I do not need that. I don’t need it. I’m really cool with it." By now we all know Clint Barton doesn’t stay a family man for long before joining Team Captain America in the field, but it will always be something that Hawkeye struggles with. "You have real life, and then you have fight life, and that’s the character that I love now – discovering that in him makes him a very sort of accessible Avenger," Renner said. "That’ll always be there, I’m sure. And it certainly plays in this one." The actor said events from Age of Ultron, which saw Clint return to his farm to live a quiet life with wife and children, pretty seamlessly tie into Civil War. 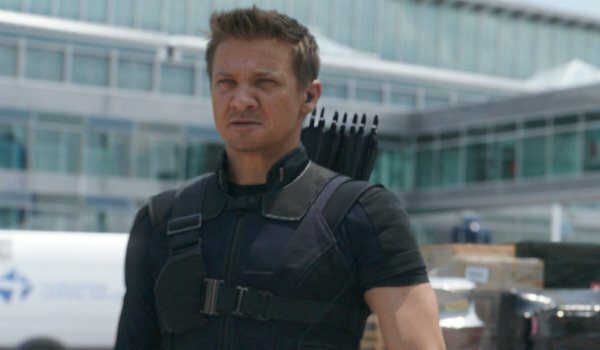 Though Renner didn’t reveal why Clint decides to go back to Avenging, he said it won’t be difficult for him to pick a side. "Barton is a pretty brass tacks kind of guy," he said. "Kinda get the job done so I can go home. So I don’t think it’s very difficult for him to decide." Cause in the first Avengers, [Hawkeye] had that short bow that cracks open, and then I can crack and close with a staff. So now I’m a master with a staff, apparently. I have to learn that today. So there’s that, and then there’s always things you can do with the tips. Except for this, what they call the aero tips, they’ll all be non-lethal cause again we’re not trying kill anybody, just sort of take control of the situation. They’ll probably throw in a lot of gimmicks with the tips and trick arrows, and things like that. It’s unclear whether Widow and Hawkeye will ever be able to repair their relationship, but Clint’s already found a temporary replacement. Wanda’s brother, Pietro (Aaron Taylor-Johnson), sacrificed himself to save Hawkeye in the battle against Ultron, something that will bond him with Scarlet Witch. "Yeah, I think there’s a great connection between these two characters for sure," Renner said. "I mean, I don’t know if she’s coming over for dinner on the Barton ranch." Don’t mistake Olsen’s superhero heels and wartime corset for weakness. Wanda is still a fearsome force. "I think people do fear her abilities," Olsen said, "and no one’s quite really sure what they fully are because she’s not either." 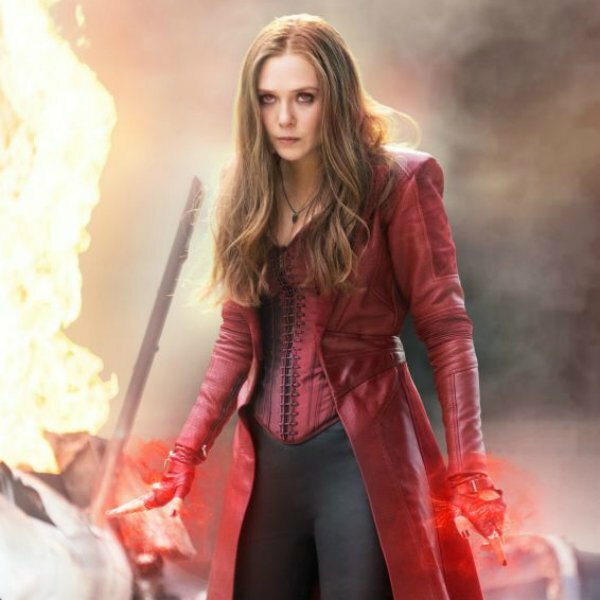 After training with the new Avengers, Scarlet Witch will return to the scene with some new tricks. Co-director Joe Russo said "she can use her power to push herself off, launch and then bring herself back down," which he remarked "is not the most graceful version of flying." Olsen teased more abilities coming down the pipeline, though she’ll largely stay away from mind control as it was such a major part of Age of Ultron. That power left many of Earth’s heroes feeling less than mighty, and this uneasiness towards Wanda carries over. According to Olsen, "I think her relationships with people become really clear and I think they all make tons of sense in mind with Ultron as well." It’s been a lonely road for Wanda, who’s been left with out a home and a family after Ultron destroyed Sokovia and killed her brother. Olsen said she creates a "surrogate family within the Avengers" as a result. I think a lot of that has to do with what Jeremy’s character – like his attitude towards her and the speech he gives her at the end of the film. So we pick up with her having started a new life, but still trying to figure out what her abilities are and if using them causes greater good or greater damage. I think there’s something unique in the fact that her powers come from the same thing that powers him, and that is how we made them have that kind of, that specifically in common, as opposed to it being something else that the comics, kind of created, just being pure romance, but they do have something uniquely special, because of that. War has broken out at a German airport. Cap and his teammates have to get to a plane, but Iron Man and his sympathizers have been tasked with stopping them. According to Moore, this is a tough situation for these characters who don’t want to kill each other but do enough damage to stop them. After both teams charge, a series of face-offs ensue: Black Widow vs. Hawkeye, Black Panther vs. The Winter Soldier, and so on. Someone who’s missing from the fray is Ant-Man. While his cast mates are duking it on on the main set, Paul Rudd has stepped off to the side to film a sequence in his own private green screen backdrop. Many reports have hinted that Scott Lang will reverse the Pym Particles to become Giant Man for a beat, and, though we can’t be sure, his movements seemed to indicate such. All more would say is, "I think Ant-Man is going to do some things that are really fun." Scott has a specific set of skills, compared to the other heroes, and he’s brought in for a very specific reason. As we saw in the post-credits scene for Ant-Man, that reason is to release The Winter Soldier from whatever prison he’s in. But soon, he too will be caught up in the larger battle. His mere presence already helps to broaden the world of a film that is so focused on specific political events. It’s like a video game, really. Everyone’s got different attributes. You look at Ant-Man and you learn more about him. And you look at Black Panther, who’s sort of like a Hawkeye or others in that he doesn’t have super powers, just a really great skill set. It’s just a great balance and mixed bag to add to the Marvel universe. When we spoke to the cast and crew, it was before even Ant-Man had hit theaters, so they were ambivalent to reveal anything too spoilery about what to expect. However, Robert Downey Jr. said he filmed "a little beat" with Rudd and walked away thinking, "Alright, watch out for that guy!" Writers Christopher Markus and Stephen McFeely joked, "We also have Ant-Man versus Peggy. It’s amazing."